There were a prayer meeting and an exercise of Splendor today in Kobe from the afternoon. I forgot to take a photograph practicing. I'm sorry. 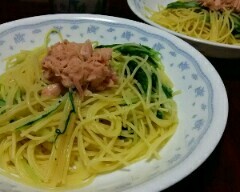 It is a photograph of the spaghetti of tuna and mizuna greens this morning instead.